This far along in the trip, I think there are some things most thru-hikers can agree on. One is that a successful thru-hike takes discipline and planning. In order to make the miles, it’s necessary to stick to a schedule, discipline yourself, and keep some sort of an itinerary at least a few days in advance. But I think most thru-hikers would also agree that an enjoyable thru-hike sometimes means throwing all of that out the door on occasion. There are days where you’ll gain far more fulfillment and satisfaction from maximizing the adventure than from maximizing the miles. I’ve met a handful of hikers who are pushing twenty to twenty-five mile days every day, without fail, no zeroes, no side trips, no town or hostel stays. I met one, Turtle, and asked him in a roundabout way why he was in such a hurry. “No reason. I just wanna finish the trail and check it off.” He didn’t seem very happy to me. The cardinal rule, really the only rule, of the AT is “hike your own hike.” So I don’t question it. But I’m a firm believer that some of the best experiences on this trip happen off the trail, and are totally spontaneous. I had first heard about the Raven at Greasy Creek, where two thru-hikers named Yogi and Skeeter were talking about him. I first met the Raven on my way into Damascus. A tall, thin, older gentleman in his late sixties, he lived in Pennsylvania and was doing the section of the AT from Springer Mountain to Harper’s Ferry – essentially half the trail. He immediately struck me as likeable and easy to get along with. As a retired paramedic, he and I had plenty to talk about, and hit it off quickly. We stayed at Woodchuck hostel together in Damascus, and hiked together for a few days until he decided to go on ahead while I took my time through Grayson Highlands and played with the ponies. The next morning at Partnership was a great reunion. Rodney cooked a wonderful breakfast, and as I packed up to go, the Raven asked if I wanted to join them for the day. Well, of course I did. So I climbed into the camper shell of Rodney’s beat-up Ford Ranger along with Leon the dog and a set of woodcarving tools, and we set off. Rodney teaches woodcarving at a local craft school. He’s a true artist – his 150-year-old cabin in Elk Creek is decorated and furnished almost entirely with pieces of his own making. 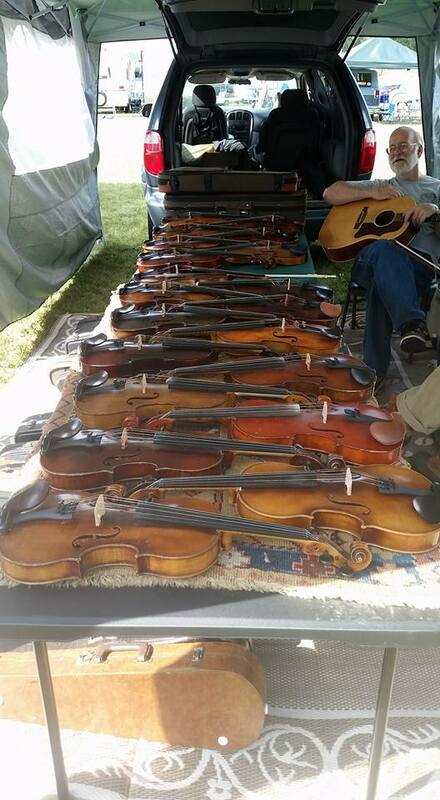 The 49th Annual Grayson County Fiddling Contest was about as genuine and authentic as bluegrass festivals get. Unlike other folk music festivals closer to major cities, there was nary a hipster to be found. No craft breweries or startup gastropubs had tents set up, instead we bought barbecue sandwiches and Dr. Peppers from a very kind elderly couple to benefit the local volunteer fire department. The music was straight old-time mountain bluegrass. No Mumford or Lumineers covers, this was Foggy Mountain Breakdown and Wreck of the Old 97. Rebel flags were everywhere. It was a sweltering afternoon and all the grandstands were in a wide open field, so most of the action was with the dozens of small, impromptu jam sessions taking place in the shade of Walmart folding canopies and the awnings of RVs. The talent was all over the map. The musicians ranged from true masters of the fiddle and banjo to others who may well have been playing on stage for the very first time that day. The three of us ambled from jam session to jam session, hanging out at one until the players stopped to take a break, and then moving to another one. We stopped at an O.D. green converted Chevy school bus out of curiosity more than anything. The Raven had been wanting to build one, so he asked the owner if we could look inside. The owner, a stout, heavyset man in a Virginia Tech shirt who introduced himself as Duke, had quite the setup. The old school bus had been gutted, and fitted with a water tank, toilet system, and air conditioning. A kitchen, bathroom, and bedroom had been rigged in, and the rest of the space was taken up with couches. All three of us looked at each other and immediately nodded. Duke pulled out a quart mason jar out of the fridge and passed it over. It was yellow-tinted corn liquor for sure, with big chunks of cut pineapple swimming in it. And it was delicious. I hadn’t noticed it, but he seemed eager to explain. As he continued to show us around the bus, the jar made its way around the circle about four times. Four swigs of pineapple shine is enough for eleven in the morning, so we thanked him and took our leave. “If only they could talk, the stories they could tell, right?” the Raven said. “Who says they cain’t?” The old man picked it up, and tapping his foot to get a rhythm, began to play the most beautiful old Irish reel, a lively, upbeat tune with a tinge of sadness, a reflection of the hard-living, hard-working immigrants who wrote it. Lost in the music, it occurred to me to wonder how many people over how many generations had played this song on this very fiddle. In that way, in that moment, we had a bond with nameless, faceless generations of mountain folk brought together by this very same song. The rest of the afternoon went by slowly, in the best sense. No one there was in any kind of hurry. No one was checking their phones. The only way we noticed the passing of time was the position of the sun, and as it began to fall, we trucked into nearby Independence for dinner. One steak taco platter and a few beers later, we headed back. As great as the music was, I couldn’t help but notice the roar of engines from the nearby Elk Creek Dragway. It’s difficult being a car guy in an environment where there are few cars and almost no fellow car enthusiasts. When I see a cool car at a trailhead parking lot or at a road crossing, there’s no one to share my excitement with. So the thought of catching a few hours of drag racing was too good to pass up. The Raven opted to stay at the festival, but Rodney agreed to join me. The back of the dragstrip complex was what adjoined the festival grounds, the front gate was over a half mile away. It was late, so I doubted they were even still selling tickets anyway. There was no security whatsoever. The track property was fenced, but that probably had more to do with keeping errant animals off the track than anything else. The fence was paltry – just a few strands of barbed wire – and bridged by a cattle gate. I strode towards the fence, vaulted over without a second thought, and kept on trucking. I turned back. Rodney was still on the other side of the fence. Pacified, he climbed over the gate. After all this time in the woods, the deafening roar of unmuffled V8s and the reek of racing fuel and scorched rubber was jarring, but intoxicating. Two passes in, a Fox-body Mustang threw a rod and blew its engine, spraying sparks, oil, and parts all over the track. Rodney and I got up from our seats and walked around to kill the half hour or so that it took to clean up the track. It was excellent having the chance to look at all the cars, shoot the breeze with the owners, drivers, and hangers-on, talking specs, quarter mile times, and racing stories. Every manner of car that could make a pass down a dragstrip was represented. Twelve-year-olds in motorcycle-powered junior dragsters made 80mph runs while grizzled men my dad’s age prepped their classic Camaros, Chevelles, and Novas, just like they’d done for the past forty years. There’s an incredible romance that surrounds auto racing. The heady mix of fuel, air, and fire, a chemical reaction turned to kinetic energy and released in a flash. The inherent danger of pushing a vehicle to the edge of the laws of physics. The heart-pounding power of eight hundred horsepower of barely-controllable American thunder. In a way, these cars are living creatures – roaring, snorting, snarling beasts of sport – in a way that your Corolla just isn’t, and never could be. They have their own quirks and idiosyncrasies that must be learned and planned for – in a manner, their own personality. And it takes a dedicated driver to get the most out of one. By midnight, the action was starting to wind down, and Rodney and I decided it was time to head back to the festival, figuring it would be about over. We figured wrong. The scene at the festival grounds was startling. When we left, the crowd had been a few dozen old folks sweltering in the grandstands and politely applauding. When we returned, it had quintupled, gotten at least two generations younger, and a whole hell of a lot rowdier. It looked like half the population of Grayson County was in attendance, hooting and hollering for their favorite bands. We were catching the end of the awards ceremony, where the bands voted best were given a cheap trophy and a few dollars gas money, and asked to give an encore performance. And let me tell you, they saved the best for last. These guys were good. The Raven found us almost immediately. “Sure, let’s watch this last set and then we’ll get out of here.”, Rodney replied. The very earth itself reeked of beer, and people danced around un-sanctioned bonfires, even though there were “ALCOHOLIC BEVERAGES PROHIBITED” and “NO FIRES” signs virtually everywhere. Some especially loud hooting and hollering was coming from a crowd gathered around an old green Chevy school bus. I suspect Duke’s pineapple moonshine had made an appearance. Part of me wanted to stay and see what happened, because I had a suspicion that the official end of the festival was only the beginning of an epic hillbilly throwdown that would last most of the night. But I also knew that if I stayed, there would be no chance of getting back on the trail the next day. We watched the last band, which was excellent, and took our leave back to Rodney’s cabin. And so concluded the best zero ever. Rodney, if you’re reading this, thank you again for your hospitality. You were a wonderful host, and did a great job of showing us around the metropolis of Elk Creek. Raven, thanks again for inviting me, and letting me be part of this experience. That day was one for the books. Not every day on the trail can be this good, and I’m not sure I’d want it to be. But a true spontaneous adventure sure is always a treat.